China with this type of brown pattern was very popular at one time and remains highly collectible today. I often find pieces like this in my travels around New England. It is a classy pattern, do you agree? 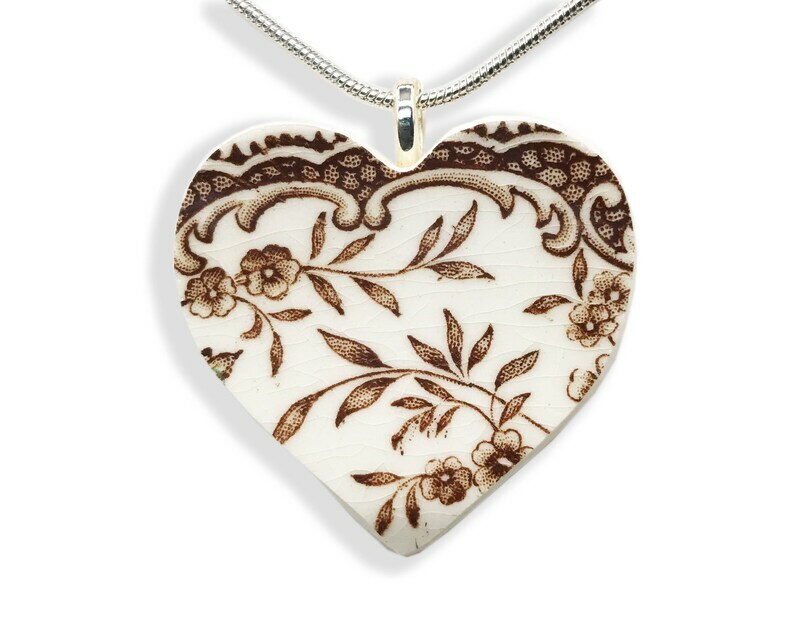 An artfully designed heart necklace says it all. LOVE! LOVE! LOVE! Hand crafted one-by-one from vintage broken china, this necklace is unique and timeless. Each piece of jewelry in this shop is made in my home studio from from my collection of vintage china. Planning an event or looking for a unique gift for a group, party or family? I can create multiples of many of the patterns of china in my shop, or you can send me something that has special meaning to you. Jewelry cut from china with sentimental value makes an extra special gift. • 1mm Silver Plated Snake Chain - 18", 20" or 24"
• 2mm Silver Plated Snake Chain - 18" or 24"
• Silver Plated Fine Rolo Chain - 18" or 24"
Feel the love when she opens this one-of-a kind gift. I'll be happy to gift wrap your necklace and add a special note from you. 22K Gold Pattern Earrings. Vintage Broken China Earrings. Mothers Day. Dangle Earrings. Broken China Jewelry. Gift Box. Gift for Her. Sweet little earrings, made of china, makes them one of a kind! Makes for a very distinctive look. Thanks! I’m impressed! Thank you very much. BEAUTIFUL NECKLACE AND ART WORK. Love that these were cut out of ceramic. Payments may be made via Direct Checkout (all major credit cards as well as Etsy gift cards) or PayPal (all major credit cards or a PayPal account). accept paypal and credit cards. Please make your payment within 3 days. If for any reason you change your mind about your purchase before you pay for it, just let us know and I'll cancel your order. Refunds? Yes. Simply return the unopened package in its original condition (you pay for return shipping) and I'll refund your payment as soon as I receive it. You will be charged a 10% restocking fee for returned items. No returns on custom or personalized items. Damages and losses. Products are well packaged in padded bubble wrapped envelopes or mailing boxes. In the unlikely event your package arrives damaged, please contact me immediately so I take care of you. USA: Standard shipping is via US Postal Service First Class Mail with Delivery Confirmation. International: Standard shipping is via US Postal Service First Class International mail with customs forms. Will you make jewelry from my china? Absolutely! I enjoy custom orders. Contact me (a photo of your china will be helpful) and we'll go from there. I do not offer wholesale orders at this time.